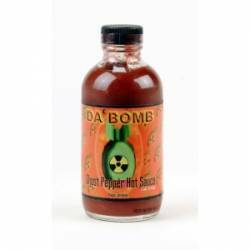 Da Bomb Ghost Pepper Hot Sauce, 4 oz. Hot Sauce, Da Bomb Ghost Pepper, 4 oz. This sauce is infused with one of the world's hottest peppers - the Naga Jolokia or "Ghost Pepper". This sauce contains zero pepper extract - just pure natural heat! Habanero Peppers, Mango Puree, Water, Lime Juice, Tomato Paste, Jolokia Chili Pepper Powder and Habanero Powder. Hot Cajun Peanut Snack 12 oz.